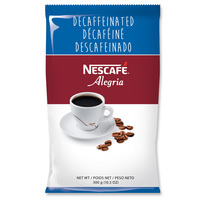 NESCAFE Taster's Choice House Blend Decaf Coffee Stick Packs create a smooth and mild roasted instant coffee made from 100% pure, responsibly sourced coffee beans. With NESCAFE Taster’s Choice, you can easily prepare fresh-tasting, consistent coffee without the hassle of roasting and grinding. Our Master Coffee Crafters roast each bean to a precise color, then carefully monitor the brewing temperature to bring you exceptional flavor. Each freshly brewed batch of NESCAFE Taster’s Choice is flash frozen to lock in the optimal coffee taste until you’re ready to unlock it. NESCAFE Taster's Choice House Blend Decaf Coffee Stick Packs help minimize product waste with their long-lasting, fresh taste versus roast and ground coffee. NESCAFE Taster’s Choice is part of the NESCAFE Plan, which helps protect the future of coffee for those who enjoy drinking it, growing it – and selling it. We believe the choices we make matter. That’s why we use responsibly sourced beans from the finest coffee growing regions around the world. When simple, delicious coffee is all you need to get more out of the day, reach for NESCAFE Taster’s Choice. We put careful attention into every step to ensure we give you a delicious cup of coffee every time. Come, have a coffee with us! It all starts with a NESCAFE.